Hello, please let me take this opportunity to thank you all for you help and support. Without your help these events would not take place and much needed money for charity would not be raised. To set and break Australian & world records by driving vehicles on two side wheels and raise money for cancer research. Australian two wheel driving distance record. (current 8km) car. 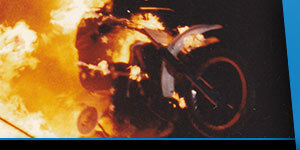 World two wheel driving distance record. (current 45km within 1 hour ) Car. World two wheel driving distance record. 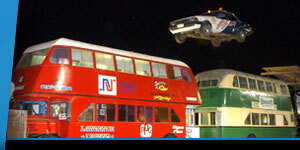 Double Decker Bus (current 246.8 metre) Australian two wheel driving speed record. ( no record ) Try for 110 kph. Car World two wheel driving speed record. ( current 175 kph ) Car. In preparation for these attempts Lawrence set two new Guinness World records for driving on two side wheels on July 30th 2005. 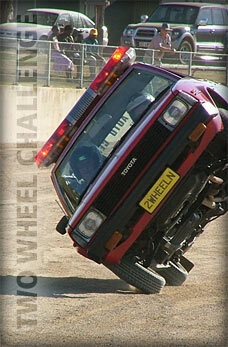 Driving a car with 8 adults on board on its side wheels for 405m (860ft) at Junee, N.S.W, Australia. Driving a 1985 Toyota Corolla on two wheels through a gap 80 cm (31.5 in) wider than the height of the car at Junee, N.S.W, Australia.